Saturday March 5 1910 I went down home at 10.12. It was most like a spring day. Will came for his dinner. John & Hattie went to Ione [Maggards?] wedding at noon. After three I came over to Eugene Harts to see him as he is very sick I came home with Will at 4.30. I was very tired It was nine years today since Lee was buried. Sunday March 6, 1910 It was a cold windy day. I got the work done and read and wrote what spare time I had a letter to Nell [Rames?] Mary Briggs Lizzy Lindley a card to Martin Potter. Will about home most of the day. 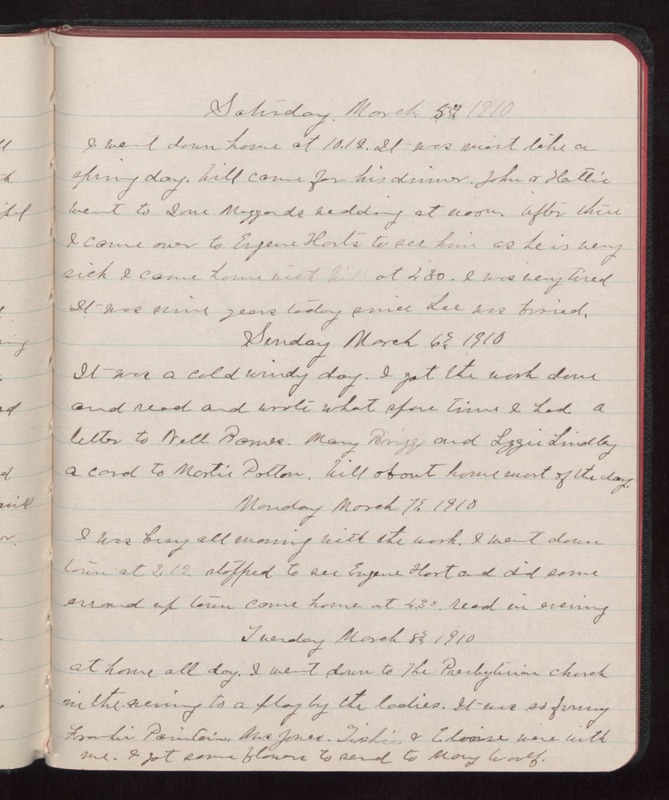 Monday March 7, 1910 I was busy all morning with the work. I went down town at 2.12 stopped to see Eugene Hart and did some errand up town come home at 4.30. read in evening Tuesday March 8, 1910 at home all day. I went down to the Presbyterian church in the evening to a play by the ladies. It was so funny Frankie Pointoin. Mrs Jones. Tishi & Eloise were with me. I got some flowers to send to Mary Woolf.